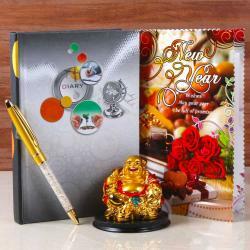 Product Consists : Designer Pen and Card Holder with Table Clock and Finest Pen along with New Year Card. 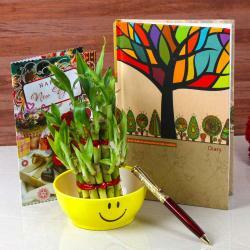 We have excellent Gift collection for New Year. This is a very sensible New Year gifting solution especially for you. 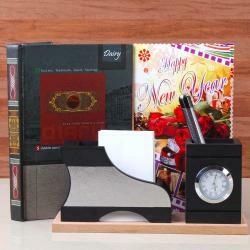 This hamper comprised with Designer Pen and card holder with table clock. Also, includes a one finest ball pen. The best greeting card which enough to enthrall the recipient, be it your friend or a family member. This gift hamper is that all set to amaze the receivers. So, order it online today! 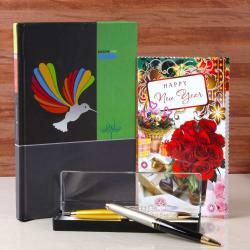 Product Includes: Designer Pen and Card Holder with Table Clock and Finest Pen along with New Year Card.